Let’s Dance! He’s the English shapeshifting boy/girl that defined glam rock. Rock ‘n’ Roll songs with eye wateringly skin tight trousers and equally brave high platform boots. David Bowie emerged out of hibernation recently with a new album to an ecstatic fanbase and press. He lives! 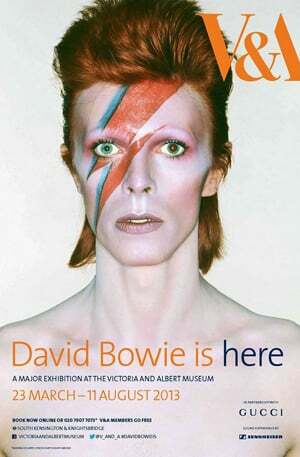 And to add to the celebration, the Victoria and Albert Museum has dedicated a whole season of talks and events to coincide with their most successful exhibition yet – David Bowie Is. Online advance tickets sold out within days, which shows the strength of feeling towards a man who, although controversial at times, is one of Britain’s most enduring international music artists. A pioneer in both music, art and fashion, he challenged gender roles and spawned many a fabulous glam rock outfits amongst England’s suburban youths inspired by his glittery attire. From his iconic costumes (spray on white catsuit anyone? One legged leather trouser in canary yellow? ), artifacts and Sound and Vision, this is one of the most extensive exhibitions ever of Bowie’s life and work. Gaze upon the handwritten lyrics, backstage snaps, graphics and artwork by the ethereal one. Bowie has such a boundless and eclectic body of work so therefore there’s plenty of Rock ‘n’ Roll history to contemplate. 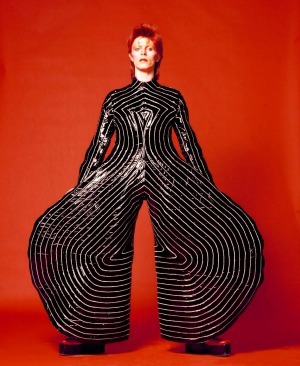 Many events are taking place to celebrate his life and work, including create your own glam rock album cover, rock instrument classes and fashion design workshops inspired by his outlandish attire. While online tickets have already sold out, you can still purchase tickets to see David Bowie Is at the V&A. They recommend getting there at 10am when the museum opens to purchase your tickets, which may not be available for immediate entry. If you’re staying in one of our vacation rentals in South Kensington, you can simply pop over and get your tickets anytime! For more details on tickets, click here. Posted on Wednesday, June 26th, 2013 at 2:48 pm in What's On. You can follow any responses to this entry through the RSS 2.0 feed. You can leave a response, or trackback from your own site.